Emails from Grey2K come in two forms: those heartbreaking ones detailing cases of greyhound abuse, neglect and cruelty and those like today, announcing victories. 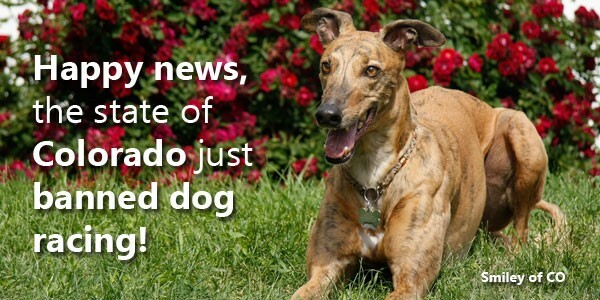 Today Grey2K is spreading the good news that Colorado has become the latest state to ban greyhound racing. Yesterday morning, Colorado Governor John Hickenlooper signed Grey2K’s bill to prohibit greyhound racing, making Colorado the39th state in which the cruelty of dog racing is illegal! Per the Grey2K email, “Drafted by GREY2K USA president and general counsel Christine Dorchak, the measure was enthusiastically supported by Colorado Voters for Animals, Colorado Citizens for Canine Welfare, the ASPCA and the The Humane Society of the United States. We all worked together to make dog racing history! Since the state’s legalization of greyhound racing in 1948, five greyhound tracks had opened and closed. Interest in the activity suffered such catastrophic declines that only one track survived by 2007. Mile High Greyhound Park reported a loss of $700,000 and ended live racing in 2008. Greyhounds in Colorado endured lives of terrible confinement and were kept in warehouse-style kennels, in stacked cages that were barely large enough for them to stand up or turn around. Cages measured just 29″ high by 29″ wide and 40″ long. Between 1993 and 2007, 2,636 greyhound injuries were reported at the state’s dog tracks. The most common injury was a broken leg and other injuries included fractured spines, paralysis and puncture wounds. In 2006, a Colorado greyhound breeder was fined and lost his license permanently after nearly 200 dogs disappeared while in his control. Thirteen greyhounds died in a Colorado breeding farm barn fire in 2005. So, thirty-nine states and counting! Keep up the good fight. You can take Grey2K’s poll to vote on which target states you want to Grey2K to focus on next in getting greyhound racing banned. This entry was posted in Stories and tagged Colorado, dog racing, dog racing banned, Grey2K, greyhound photo, greyhounds, News, Representative KC Becker by greyzoned/angelsbark. Bookmark the permalink.